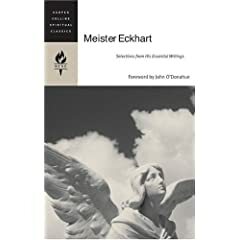 Eckhart von Hochheim--more commonly known now as Meister Eckhart--was unusual for his time but this isn't apparent from his childhood or his education. He was born in Germany in the year 1260. His family was wealthy and considered to be of "noble" blood. Yet, we know very little else about his family. He attended the University of Paris and was raised as a Christian. After receiving some of his extensive education he joined the Dominican Order and committed himself to a life of preaching and teaching. He continued to study and receive academic validation and support from his brothers and sisters in the Faith. Eventually, he was named as a lecturer and teacher of theology in more than one institution. As far as this goes, it seems that he was absolutely typical for an educated man with an affluent background in the 13th and 14th centuries. But, as his name got around and more people were exposed to what he had to say, the commentary became focused on how unusual his sermons were.